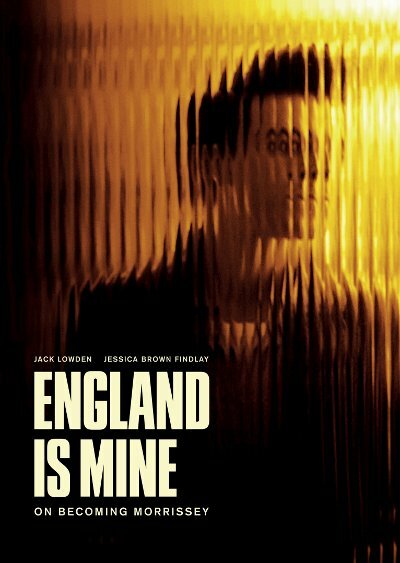 England is Mine is a new drama about the early days of Morrissey, the iconic pop star and original front man for the seminal band, The Smiths. Directed by Academy Award® and BAFTA-nominee Mark Gill, the film stars Jack Lowden as the artist formerly known as Steven Patrick Morrissey and Jessica Brown Findlay of "Downton Abbey" fame as his soul mate and muse. Set in Thatcher's Britain of the 70's and 80's, a time when working class Manchester was beset by unemployment and riots, the film tells the story of 17 year-old Steven (Lowden), a painfully shy, intellectually precocious loner who lives for, and writes about, the burgeoning local music scene-a surprisingly vibrant subculture in an otherwise drab industrial city. Too intimidated to join that scene, he writes reviews from the sidelines, imagining what he would do if he were on stage. When one of his write-ups is noticed by kindred spirit Linder Sterling (Brown Findlay), an aspiring painter, the two become fast friends, and she pushes him to form a band and take to the stage. Steven finally works up the courage to book a club date, and performs a dazzling cover of an old girl-group standard. This is the first time the world gets to hear the distinctive, emotion-filled voice that would eventually propel him to stardom. That very night, a manager reaches out with an offer. Unfortunately, it's only for guitarist Billy, not the lead singer, meaning Steven will be left behind. His dreams of a musical career vanish and he's left with nothing but wasted days at a soul-crushing civil servant job, and lonely nights holed up in the same bedroom he's slept in his whole life. Only his mother's unwavering belief in his talent, and Linder's constant reminder-"be yourself, everyone else is taken"-give him the strength to keep trying to become the artist he was always meant to be. Brian Perera, founder of Cleopatra Entertainment, says "Our company has deep roots in music, so we couldn't more excited to bring this film over here to US audiences and to Morrissey's enormous fan base." Director Gill, who also wrote the screenplay (with William Thacker), burst onto the international film scene with his 2011 short film, The Voorman Problem, which earned him an Academy Award-nomination for Best Live Action short, as well as a BAFTA nomination. Lowden's stage work (which has already earned him the UK's highest honor, the Olivier Award) was recently featured in Christopher Nolan's Dunkirk, and films such as A United Kingdom and '71. Since capturing, and breaking, hearts as Lady Sybil in the smash success Downton Abbey, Brown Findlay has also been seen in Winter's Tale, The Riot Club and Victor Frankenstein. Baldwin Li, Gill's producer and fellow Voorman Oscar-nominee, produced ENGEngland is Mine along with Orian Williams, producer of Anton Corbijn's Control, the multi-award-winning biopic of Ian Curtis and the band Joy Division.